Shaeron Caton-Rose has been exhibiting for over 20 years, making artworks using text, print, textiles, video, bookmaking, found objects and sound. Her work explores the meanings and narratives behind assumed realities, both in terms of faith and other ideas about ‘how the world is’. Recent shows include Tears of the Angels, an immersive installation for Leeds Light Night 2015, and Ordinary Time, a printmaking installation produced from her recent artist’s residency at the Community of the Resurrection, Mirfield. Previous works include Glossary, a collaborative show in which she has made artist’s book with adults with visual impairment and disability, Procession, a large-scale intervention at Kirkstall Abbey in 2012, and Sticks and Stones for York Minster in 2010. An immersive installation about the invisibility of climate change that creates a meditative feast of sound and sight. Seventy-seven hand-crafted bowls are imprinted with the chemical equations for rain and acid rain and filled with water. From a distance all the bowls look the same, its only on close examination the viewer can see the difference. 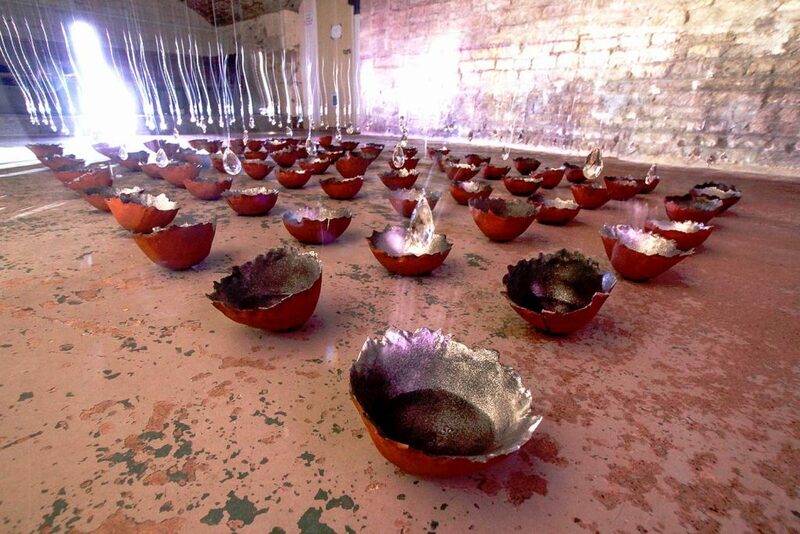 The bowls are displayed under a shower of crystal raindrops and with a thunderstorm soundtrack and a trance-like video piece.